Until DC Becky Greene starts opening doors…and discovers a crime scene behind almost every one. The police hope it’s a prank. Because if it isn’t, a murderer has just surfaced – someone who’s been killing for twenty years. It’s shaping up to be a deadly little Christmas. Detective Constable Becky Green arrives for her shift at the police station nine days before Christmas. On arrival, she is handed her mail, including an envelope addressed to ‘To a detective who knows what to do’. Inside the envelope is a home made advent calendar. Opening door number one Becky discovers a small photograph of a murder scene, in fact, it is her colleague, Detective Sergeant Eddie Carmine’s most recent and unsolved murder. Behind most of the doors is a different murder scene, but there are a few left blank, presumably for the killers next victims. The race is on to find the person who is responsible and bring them to justice, but how, when all they have is a tiny photograph as evidence? 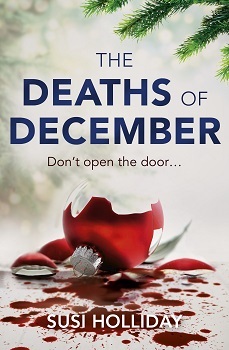 The Deaths of December complete and utterly perked my attention with its synopsis. I love a good Christmas book, and I also love thrillers, so the combination of the two was not to be missed. The book is split into days, counting down from nine more sleeps before Christmas, until one day to go. It is also told from various points of view, including Detective Greene, Detective Carmine, The Photographer and a young woman called Carly. From the start you know who, though not by name, and the basis of why the killer is killing. From what we are initially told I did think it strange as to why someone would become a serial killer for that reason, but as the plot progressed I understood more and more. Then the epilogue confirmed everything for me. Both Becky and Eddie are very likeable and authentic. Having worked at a police station, including the CID department, at times it was like being back in the open office. Ms. Holliday certainly did her research into the life of a detective thoroughly. The book is filled with gripping and quite often tense moments. The plot is original and very realistic. If I have one little gripe it is with the ending, I’m not saying it’s not good, it was just not in the direction I was expecting Ms. Holliday to take us. I can’t really tell you anything about it as I would spoil the book for you, but I do wonder whether this is the end, or is there going to be a sequel. 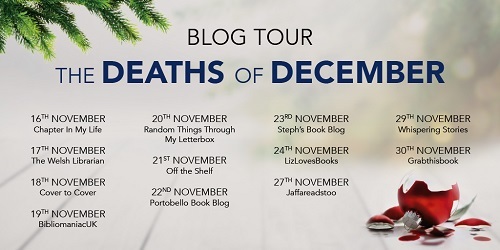 If you are looking for a thriller that is going to excite you, something to get your teeth into and keep you hooked, I would definitely recommend reading ‘The Deaths of December’. Susi Holliday grew up in East Lothian. 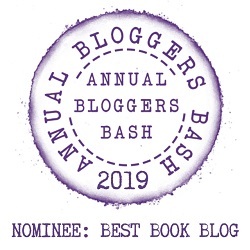 A life-long fan of crime and horror, her short stories have been published in various places, and she was shortlisted for the inaugural CWA Margery Allingham competition. She is the author of three novels in the Banktoun trilogy, Black Wood, Willow Walk and The Damselfly. She is married and lives in London. Such a chilling book theme idea, very seasonal! This looks cool. I’ve been wondering how someone could make a non-romance out of Christmas time. If you like thrillers, then this is a great book to read – very festive! Sounds like an interesting read! It’s always interesting to see how an author develops the story if we already know who the killer is. It’s an interesting take on a murder mystery! Thank you for the lovely review! It isn’t often you see Christmas and thriller thrown together, but it looks like the author did the combination justice. That cover is also one of the most clever ones I’ve seen.